PARIS — Amid difficulties for the European launch industry, and with Brexit looming on the horizon, European Space Agency executives face a challenging year ahead. 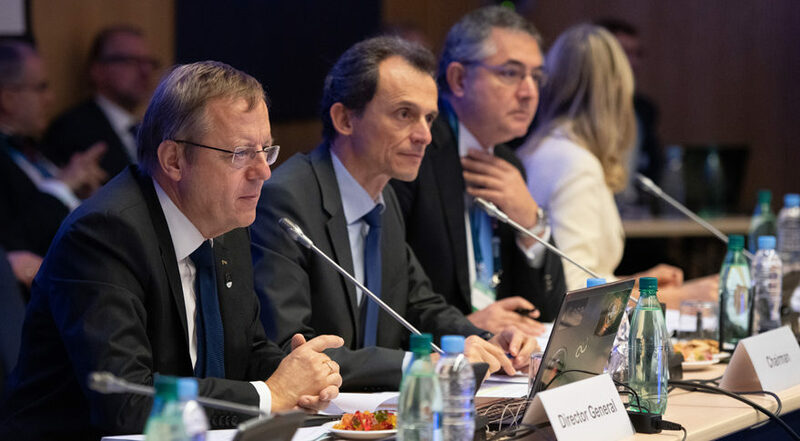 Jan Woerner, ESA’s director general, held his annual press breakfast Jan. 16 in Paris, outlining his vision for 2019, at the end of which, ESA will hold its next ministerial meeting to secure funding for its programs for the next several years. Dubbed Space19+, the meeting is set to take place in Seville, Spain, Nov. 27-28. This year will see crucial milestones in Europe’s transition from its Ariane 5 and Vega launchers to the next-generation rockets, Ariane 6 and Vega C.
On Jan. 25, launch provider Arianespace will conduct the qualification motor-1 test of the P120C solid rocket booster, said Daniel Neuenschwander, ESA’s director of space transportation. With the closing of a critical design review by the end of February, Vega C’s maiden flight will be decided. The same process for Ariane 6 will wrap up by the middle of the year, at which point the maiden flight of Ariane 6 is expected to be announced. This transition comes at a worrying time for the European launch market. Arianespace, the first commercial launch company and a longtime leader in the field, has faced an uptick in competition from newcomers like SpaceX, and orders for commercial geostationary orbit satellites recently went into sharp decline. “For Ariane 6, we aim at 14 launches [for the first model] so production has to start very soon for these and this has to be ordered very rapidly,” Neuenschwander said. Seven of those launches are meant to be commercial. In September 2018, Arianespace signed its first commercial customer for Ariane 6, the Paris-based fleet operator Eutelsat, which ordered the launch of five satellites by 2027. At Space19+, Neuenschwander said he will request additional funding to support the transition to Ariane 6 and Vega C from ESA member states. He said he is currently negotiating that requested amount with industry partners. Neuenschwanderdid not, however, envision a future in which Europe pulled out of the launch market. “If you want to develop your society, you want to make sure you have your own autonomous capacities,” he said. In addition to trying to secure a stable transition for the first models of these new launchers, Neuenschwander said that in Seville he will also propose “activities on competitiveness increase” in Ariane 6 and Vega C, with an operational horizon of 2025. He will also ask for funding “to prepare the technological building blocks” — such as more advanced propulsion systems and upper stages — so that they can decide at the following ministerial meeting in 2022 if Ariane 6 and Vega C can continue being used with upgrades, or if ESA needs to take a more “radical” approach at the 2030 horizon. ESA will also have several European political concerns to deal with this year. A day before the Jan. 16 meeting, British Parliament had rejected Prime Minister Theresa May’s Brexit deal, less than three months before the U.K. is scheduled to leave the European Union. Woerner said there no big difference whether the U.K. is a member of the EU or not, because ESA is already accustomed to dealing with its two non-EU members, Switzerland and Norway. And this year Woerner will be drafting a Financial Framework Partnership Agreement to better define the relationship between ESA and the EU, which has been increasing its space activities with programs like Galileo. At an intermediate ministerial meeting in October, Woerner got a mandate from the ESA member states to negotiate the terms of the FFPA, and he said he expects to have a first draft by the end of the year so that the agreement can be finished by the end of 2020. This week ESA also released its 2019 budget, which is 5.72 billion euros ($6.5 billion), up from 5.6 billion euros in 2018. ESA has one astronaut, Luca Parmitano, of Italy, scheduled to fly to the International Space Station in 2019. Woerner said that it is ESA’s intention to fly all the astronauts of the 2009 selection twice, and that announcements about future assignments for members that cohort can be expected soon.